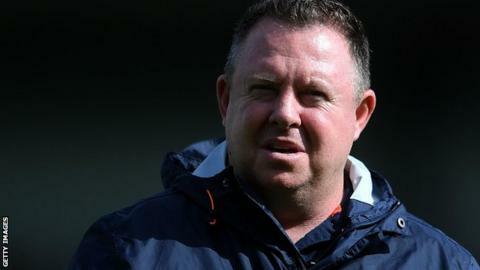 Leicester Tigers head coach Matt O'Connor has left the club with immediate effect. Assistant coach and club stalwart Geordan Murphy has been put in temporary charge of the first team. Leicester missed out on a place in the Premiership play-offs for the first time in 14 seasons in May, ending the season in fifth place. Former Australia international O'Connor was in his second spell at the club, having been appointed in April 2017. He was a coach under Richard Cockerill between 2010 and 2013. He replaced Aaron Mauger, who had been in charge for four months after Cockerill was sacked by the 10-time Premiership champions. "We believe the time is right to make this change," chairman Peter Tom told the club website. O'Connor was in charge of Leicester for the final three games of the 2016-17 season as the club beat Newcastle and Worcester to seal fourth place, before losing out in the play-off semi-finals by one point at Wasps. But last season the Tigers lost nine times, with defeat at home to Newcastle in the penultimate game of the season ending any hope of a top-four finish. "I'm not surprised he's been sacked," former Leicester fly-half Bleddyn Jones told BBC Radio Leicester. "The players weren't on his side and you could see that on Saturday. I think he had lost the dressing room. "His demeanour showed an air of resignation. He played players that had been injured and didn't have match fitness. "He didn't look happy, but I thought they'd give him a month. But obviously, things weren't right in the camp." Murphy won eight domestic and two European titles as a Leicester player. He will lead fellow coaches Mark Bakewell, Boris Stankovich and Brett Deacon until a successor is appointed by the club. "Leicester Tigers will always aspire to challenge for major honours in the incredibly competitive arena of professional elite club rugby and everyone at the club will fully support Geordan and the management group in driving the team forward," Tom added in a statement. "Geordan knows the expectations and ambitions of the Tigers as well as anyone after more than 20 years here as player and coach, and we wish him and the team the very best for the challenges ahead." Rugby Union Weekly: Bad Tigers, good Bears and the best pass ever? Read more on Rugby Union Weekly: Bad Tigers, good Bears and the best pass ever? A blip or in decline? Why did Leicester miss out on play-offs? Read more on Leicester Tigers: What's behind Premiership club missing out on play-offs?